We are so excited about our NEW classes starting at Milestone tomorrow, April 14th! Jeff Howard is now teaching exclusively at Milestone and has an amazing new lineup planned alongside Jennifer Lowe. We are elated to have both of them as a part of our Milestone team to help us continue to provide you the latest and greatest in the fitness industry. These new classes will allow you to challenge yourself in a fun and encouraging environment and keep you inspired to be the best version of you! 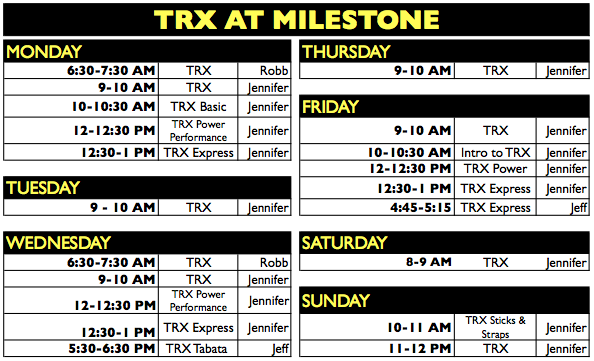 Here are the new TRX classes + class descriptions and pricing. INTRO TO TRX: Kick start your fitness program with this Level 1 Basic class designed to introduce the "new" student to the basic principles of TRX Suspension Training. You will learn the set-up and use of the TRX, along with the correct body position, alignment and basic TRX movements. Emphasis will be on range of motion, function movement and strength, balance and stability. TRX BASIC: Now that you've mastered Intro to TRX, you're ready to step it up a notch with this Level II Basic class. Moving on to this simple yet challenging TRX workout, you will increase total-body flexibility, mobility and stability all while engaging the core. Get ready to pick up the pace as we build strength and stamina with basic foundational exercises along with TRX combo moves. TRX: Ready to challenge your workouts with high intensity, powerful movements at faster tempos? This class has timed interval sets combined with TRX exercises and cardio moves. TRX EXPRESS: This is the most intense 30-minute metabolic workout you'll ever experience with the TRX Suspension Trainer. Feel the total burn as we move from lower body to upper body to core. We don't mess around here! TRX POWER PERFORMANCE: This class is 30 minutes of continuous strength and cardio moves designed to push your physical limits though powerful high intensity moves using the TRX straps and stick. This class requires prior TRX experience at a strong intermediate or advanced level. TRX STICKS & STRAPS: If you're serious about your fitness and athletic performance and eager to see results, this non-stop metabolic workout is for you. This workout includes challenging total-body strength circuits using the TRX straps mixed with TRX stick intervals in both aerobic and anaerobic training zones. Guaranteed to challenge our strength, stretch your endurance and make you sweat. TRX TABATA: Take these two elements combined to push you to your limits while still feeling successful...we dare you to try this! NEW AND IMPROVED CLASSROOM D!